Freakin' 2018 Topps Archives hobby boxes have been delayed again, now not coming out until late October (10/24/2018)! Crazy it's taking them so long, seeing as retail packs and blasters were released back in the middle of August (8/15/2018). Geez.. What's the hold up? Frustrating for me since I pre-ordered a couple hobby boxes back in the spring. Getting impatient. So I've had to tinker with the planned schedule for my stockpile of unopened cards that I ration out each month. My Archives boxes will have to become my November break now. So for September, I dug out what I had originally planned to save for November: 2009 Upper Deck Signature Stars Baseball hobby box. Nothing too exciting, but let's check it out. 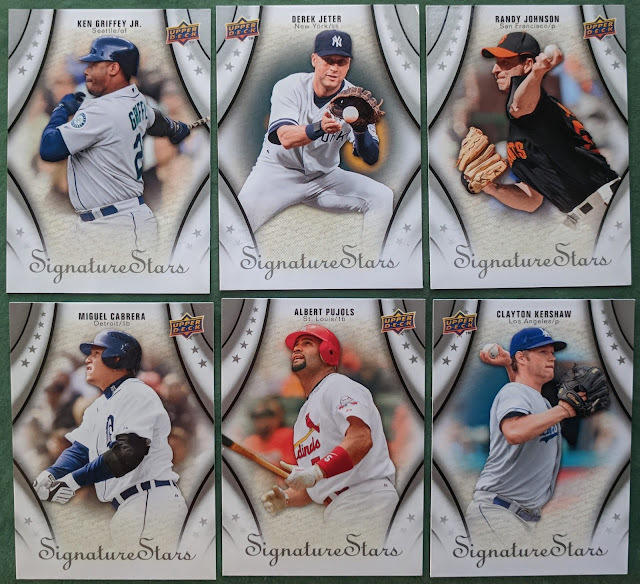 A pair of highlights from the inserts. 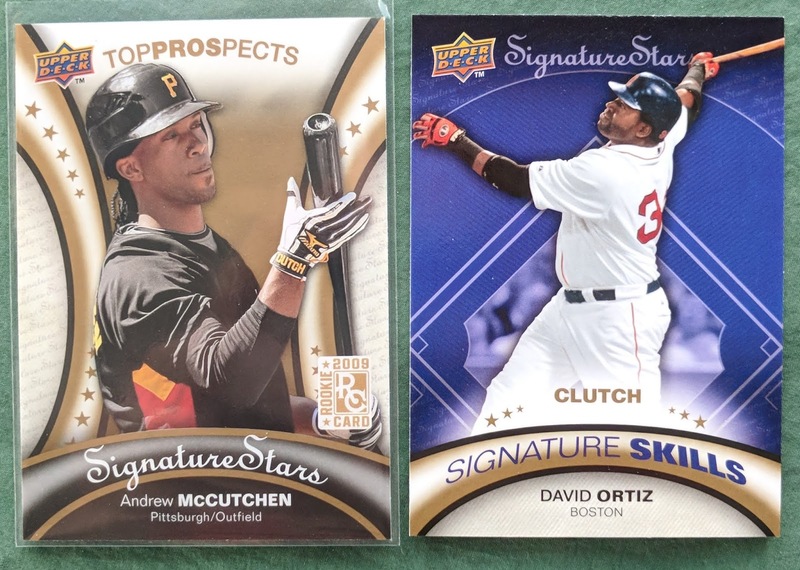 Andrew McCutchen doesn't have many Upper Deck cards, seeing as he was coming up just as UD was being sued out of the baseball card market.. so it's kinda neat to get this one to mix in my PC with all the Topps and Panini cards. 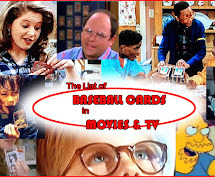 Some of the base card highlights, including an early Kershaw. 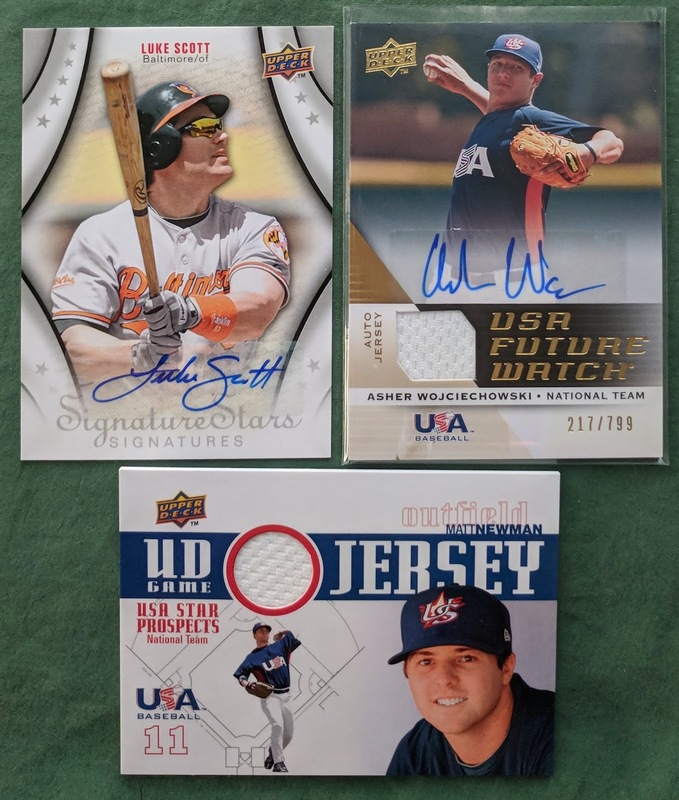 The box (which I paid a blaster-and-a-half for during a Black Friday sale last year) promises 4 hits, but the downside is most of them are no-name Team USA kids. And seeing as the product came out nearly a decade ago, if you haven't heard of them by now, you never will. 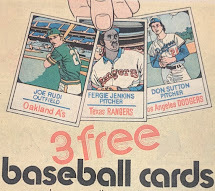 These 3 cards are available for trade. Luke Scott had a respectable 9-year MLB stint swatting 135 career dingers, mostly for the Astros and Orioles. Asher Wojciechowski made the show in 2015 and also pitched in 25 games for the Reds back in 2017. He's still active but spent 2018 in AAA. Matt Newman played in the Blue Jays chain, but topped out at AA a few years back. Every pack included a thick "dummy" blank card for some reason (I guess to dissuade pack-searchers, but it wouldn't be hard for them to figure out and work around, as the dummy card is thicker than all the hits, at least in my box). So that was kind of annoying, but at least I can repurpose them for making sketch cards. 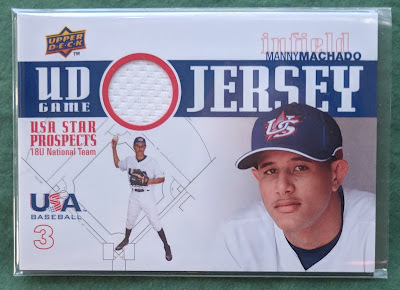 But let's wrap up with my 4th hit, which was a solid one..
Hey, Manny Machado! There's a guy who panned out. Cool to add a pre-rookie relic card to my PC of his, even though it's not a very interesting card.. with just a boring little plain white swatch. But it kept me from feeling like the box was a dud, at least. This is one of my favorite products to crack. Good pull with the Machado. That early Kershaw is fun too. Congratulations on pulling that Machado! Didn't realize he had cards from 2009. Very cool. This is a real gambler's product. You can either go big with an early Bryce Harper autograph or a Manny Machado autograph or a Derek Jeter autograph, or you can go home with an autograph of a total bust. i wonder what happened with Archives. Collation was terrible in my blasters. I doubt they would pull a product for that reason, never caring before. I'm impressed with your ability to keep a reserve of unopened product. It never works for me. Just one more pack...good thing I don't drink or do drugs, having an apparent addictive streak in my personality.